Congress has a record low approval rating, which perhaps is why the most successful Senators appear to be those who haven’t spent much time there. Barack Obama sure didn’t waste much time in the Senate before successfully running for president. Hillary Clinton is a special case as her time in the Senate is only a small part of her resume, but she didn’t spend very much time there either. The most popular Senator from each party today very well might be a freshman. Both have ignored the old tradition for new Senators to be fairly quiet. I’ll be honest – I cannot believe that we are even having a debate about whether employers can deny women access to birth control. Guys, this is 2014, not 1914 . Most Americans thought this was settled long, long ago. But for some reason, Republicans keep dragging us back here – over and over and over again. On the Republican side, Rand Paul has generated the most excitement. As his foreign policy views are out of step with those of his party, there are real questions as to whether he has a chance to win a Republican presidential nomination. Gallup found that he falls just slightly behind Mike Huckabee among potential Republican candidates at this time. Aaron Blake looked at other polls to show that Paul is in a strong position to possibly win in both Iowa and New Hampshire, which certainly would give him strong momentum towards winning the nomination. Should Paul manage to win the nomination, a Quinnipiac poll shows that Paul is the strongest Republican candidate against Clinton in Iowa. Of course that might not hold nation wide. A Huckabee versus Paul race for the Republican nomination would certainly offer a choice of different views. 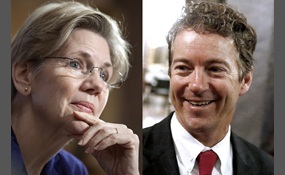 A presidential race between Paul and Warren would do the same, and most likley excite many on both the left and right far more than, say, another campaign between a Bush and a Clinton. Of course a race between Clinton, as opposed to Warren, and Paul is far more likley considering the state of the Democratic race. As I discussed previously, this would lead to a reversal in partisan foreign policy perspective, with the Democrats having the hawk as a candidate. As Peter Beinart pointed out, she sounded more like George Bush than a Democrat on foreign policy on her recent appearance on The Daily Show. Updates: Digby also questions Clinton’s statement. Politico reports that Warren rallies the base. John Dickerson thinks a Warren run would be a good thing–but primarily to provide a worthy conversation and to “force Clinton to draw clear lines about what she believes, why she’s running, and why her message is something more than ‘It’s my turn. '” I would be more interested in a challenge to Clinton from the left which could actually beat her for the nomination, but that doesn’t look likely.